While the ability to enter orders in your POS may seem like an obvious must-have for any restaurant, it’s important to remember that pizzas are different. Pizzas are personal. Your point of sale must be able to accommodate create-your-own, half-and-half, and extras on your pizzas. Do you use a price per topping model? In that case, the pricing must change for large, medium, and small pizzas, for topping number, and for any coupons applied. A pizza-specific point of a sale is the way to go for fast, simple order entry. Delivery concept restaurants have an advantage over other restaurants: customer information. For every delivery order, a customer record should be created or updated in your point of sale system. This creates a wealth of data that can be used for marketing, reporting, business insights, and good customer service. 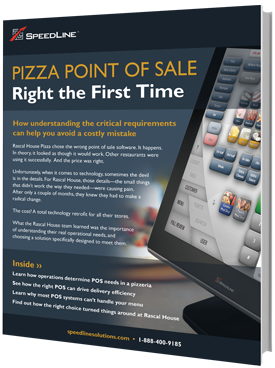 If your pizzeria offers delivery, then your point of sale must be able to support it. Delivery requires a whole set of technologies to work in tandem with your point of sale, such as integrated caller ID, online ordering, dispatch, mapping, and driver routing. These tools permit your restaurant to effectively manage delivery orders from start to finish. Mapping and driver routing ensure your drivers take the most efficient route, and don’t waste time lost or in traffic. Mapping systems for delivery that integrate with the point of sale, like SpeedLine LiveMaps, also check addresses as they are entered. This is important for quoting delivery times, adjusting delivery fees, checking for accuracy, and avoiding fake orders. A good delivery and mapping software should also keep track of your deliveries over time, and report on the shift’s, week’s, month’s or year’s delivery performance. Are deliveries arriving on time? Where are most of your deliveries going? In a previous post, we covered visual analytics and how that information can help you analyze your delivery statistics and use them to improve operations. With delivery orders, your customers are not standing at the counter, or seated at a table. Today, most customers prefer to order online, which is our must-have feature #4. Some online ordering websites send orders to an email address or a second device like a tablet, where they must be re-entered into the POS. This creates a risk-point for errors. Instead, look for an online ordering provider that integrates directly with your point of sale. 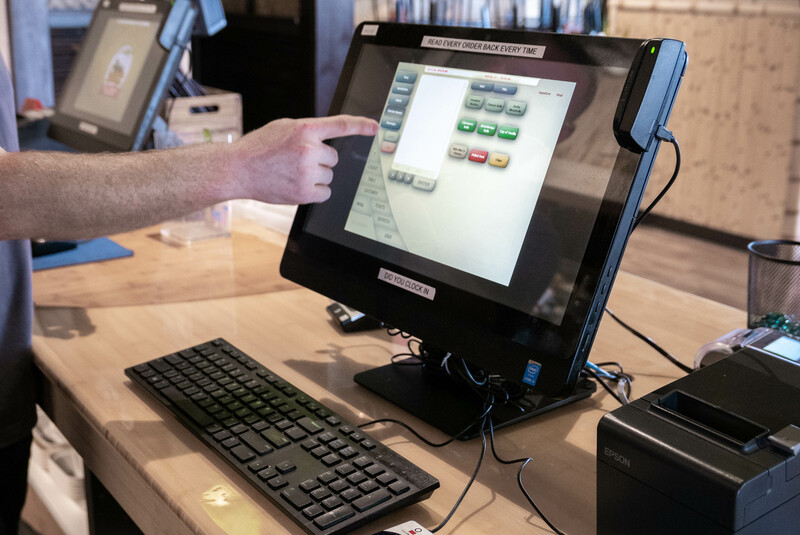 Integrated online ordering ensures orders go directly to your POS, eliminating both the risk-point, and the associated re-entry time. How long does it take your staff to input all of the customer information each time they call? The phone number, address, customer name, special delivery instructions, and finally the order? If your POS has a customer database (which it should, see must-have feature #2), and this customer has called before, their information will pop up on the screen when your staff answer the call. From there, your staff only need to confirm the information with the customer. In a recent post we outlined ways to increase order entry efficiency. Knowing who is calling, and whether or not they are repeat customers, can improve accuracy in addition to speed of service. Less errors mean happier customers. Keeping track of your sales is important, but keeping track of your costs even more so. For each item sold, how much inventory is used? What’s the cost of that inventory? Basic business classes will teach you how to calculate the cost of goods sold, and why it is critical, but putting it into practice is another thing entirely. Above, we talked about how complicated order entry is when pizzas are involved. On the backend, calculating the cost of goods sold for each variation is just as complicated, and your point of sale must be able to handle it. Do you offer delivery, or dine-in? In both cases, offering customers the ability to pay at the table, or upon delivery by EMV credit card, greatly improves payment security. Pay@ the Door, and mobile EMV PIN pads ensure all payments are card-present. In this post, we went over the advantages of card-present EMV transactions for Pay@ the Door, but the same points are also true for tableside payments.